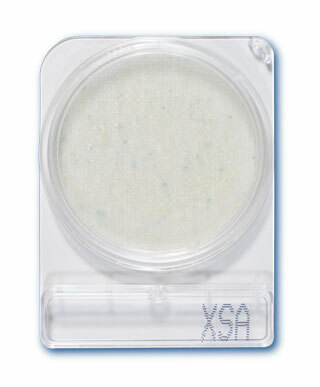 Compact Dry X-SA is a ready to use, chromogenic plate for detection of Staphylococcus aureus. Drop 1 ml of specimen (dilute if necessary) on the middle of the Compact Dry plate. Add buffer solution to the sample and homogenize by stomacher®. Drop 1 ml of specimen (dilute if necessary) in the middle of the dry sheet of the Compact Dry plate. “Swab for Compact Dry” offered by HyServe Id-No. 1 002 952/3 (40/240 pieces). · Open the cap and drop 1 ml of specimen in the middle of the Compact Dry plate. · Specimen diffuses automatically and evenly into the sheet and transforms the dried sheet into a gel within seconds. · Put the cap again on the plate and write the information needed on the memorandum section. · Turn over the capped plate and put in the incubator. 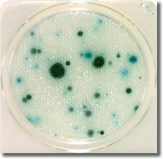 · After incubation count the number of light blue/blue colonies. White paper placed under the plate helps to count the colonies. 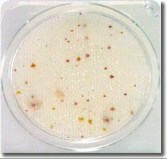 · High bacteria concentrations on plates will cause the entire growth area to become red/pink. In this case dilute the sample. · After use please follow the current disposal regulations. · The growth area is 20 cm². The back of the plate has a grid carved of 1 cm x 1 cm to make the colony counting easier. In case of any difficulties to count colonies due to large number of colonies grown, total viable count can be obtained by multiplying 20 by an average number of colonies per grid counted from several grids. · Compact Dry plates are produced at an ISO 9001 certified site.